Hunger in America: Tracie McMillan’s National Geographic story on food insecurity. 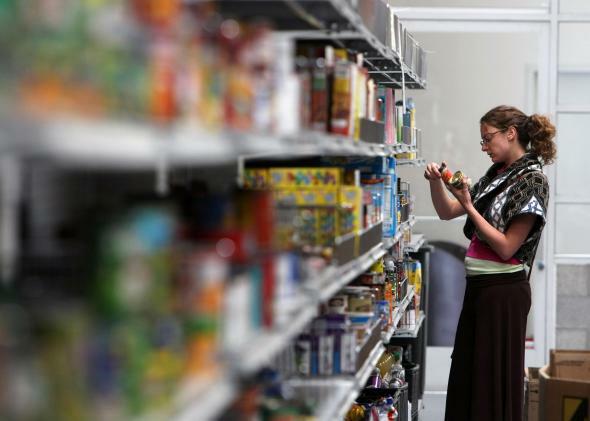 A woman shops for canned foods at a food bank in San Francisco, California. In 2006, the U.S. Department of Agriculture adopted the term food insecurity to describe the “economic and social condition of limited or uncertain access to adequate food.” Like so much bureaucratic jargon, the phrase is clinical and opaque. Food insecurity may be more exact than the old term, hunger, but it doesn’t convey much about what it’s like not to have enough to eat on a regular basis. McMillan takes aim at various misconceptions about poverty and hunger by profiling four families across the country. Think all you need to eat healthy on a budget is cooking skill? Talk to Jacqueline Christian, a mother of two who works full-time as a health aide and wouldn’t have the time or energy to cook even if she weren’t living in a homeless shelter. Think it’s impossible to struggle with hunger if you’re overweight? Spend some time with Christina Dreier, an obese stay-at-home mom in Iowa who skips meals in order to feed her kids tater tots and hot dogs from a local food bank. Think food banks are an adequate safety net for the food insecure? Go shop at one with Kyera Reams, another Iowa mom who tells McMillan, “We wouldn’t eat healthy at all if we lived off the food-bank food,” and who literally devotes most of her waking hours to cooking, canning, foraging, and gardening so that her kids can have fruits and vegetables. What goes unsaid in McMillan’s article is that the task of feeding children on an inadequate budget falls primarily to women. That women still do the majority of household labor is well known, but usually it’s discussed in the context of middle-class obsessions like leaning in and the mommy wars, not in the context of growing poverty. These exchanges are exhausting and heartbreaking to read about—but it’s worth your time to do so. It’s common to see headlines about how poverty disproportionally affects women, but it’s rare to get such a clear glimpse of what that really means.